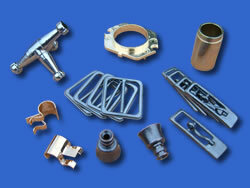 We have nearly 80 years experience in the electroplating industry. Some of our more recent market activity is detailed below. Electronics: The need for plating in the electrical and electronics industry is primarily for enhanced conductivity and soldering. 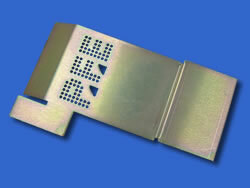 Plating services relevant to the electronics industry include silver, gold, nickel, and copper. 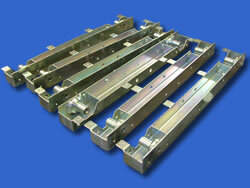 We provide certificates of conformity as well as a fast service. 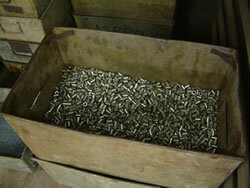 The image to the right shows thousands of silver plated electrical contacts being weighed. Engineering: Most of our engineering clients know exactly what finish they want as its on the drawing, and they want it fast. Finishing is the last part of a long engineering process and when our clients are behind, they know they can count on us to do the job quickly. We operate 24 hours a day, 7 days a week. We have taken delivery of engineering components from Plymouth in the morning and had them returned that same evening with a tin finish. If you have a rush job, call now on 07971 989 178 07866 688395 or 020 8520 5361. Architectural: We work closely with architects to ensure that they get the finish they want. We recently carried out work for an architectural practice that wanted brass struts in a board room to match the colour of the existing veneering. We offer a range of plating services that offer variations in colour such as gold, silver, antique bronze, oxidized copper and phosphating as well as finishing services such as polishing and rumbling. Corrosion Protection: One of the most common reasons for the use of electroplating is to increase an items resistance to corrosion. Zinc, nickel and chrome are all ideal for this. 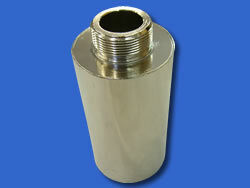 We offer a wide range of plating options including multiple coats and specialist sealants, lacquers and oils. We also have the technology to analyse the thickness of a surface coating, and to carry out salt spray testing. The items to the right are for use in mail sorting machinery and have a zinc coat with a Tri-Passivate. Decorative Finishing: Many of our clients need a decorative finish, whether or not the plating requires additional qualities. We offer gold, and gilt coatings as well as silver, copper, brass, bronze, and chrome in a variety of luster including dull, bright and satin. We also offer a variety of black coatings including chemi-black, ebernole-c and phosphate. The item to the right is a brass plated lampshade. 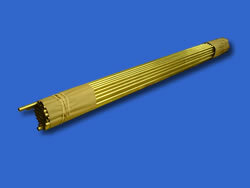 Cleaning: We offer metal cleaning as a service for both old and new components. Chemical cleaning is useful for stripping internal areas of items such as tubes & pipes or components where internal weld is present and machining is not possible. It is also useful for preparation of material for conventional finishing, electro & electroless deposition and surface conversions. We also offer polishing and rumbling services. We provide a rapid turn around on cleaning jobs and cater for most items. 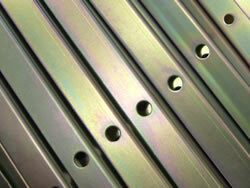 Flexible Finishes : We offer de-embrittlement for items such as springs where a soft flexible protective finish is required by ensuring that all hydrogen is removed items after coating as well as hard finishes such as electroless nickel with thicknesses of up to 300µm for a hard wear and impact resistance finish. 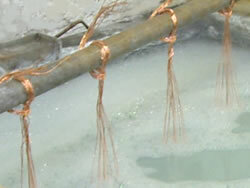 Restoration: We offer restoration services to industry as well as the general public. 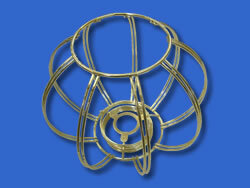 Whether its chrome, silver, gold or pickling, we can offer you a quick turn around. We handle hub caps, displays, trophies, railings, hydraulic piston rods, valves, and just about anything that already has a plated coating. If you have a restoration project and are looking for an electroplating service, call us now on 07971 989 178 07866 688395 or 020 8520 5361.